Radio is a great medium to work in. Radio is a great way to listen to music, and radio is a great friend on a long journey or just at home. At one time radio was the only way to hear the latest pop songs, and albums and to keep up to date with the top selling singles in the charts. Before music television (MTV began in America on August 1st 1981) young people listened to the radio, and bought singles after they had heard them on the radio. Radio has developed in three distinct phases. In the first wave, starting in the 1920s, radio was the only broadcasting medium, and was listened to at home by all the family on a big valve wireless. Big band dance music was particularly popular, broadcast cast live from London ballroom venues. 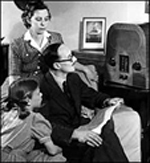 The second wave came with the advent of television in the fifties, when radio became a secondary medium. Radio was listened to in the car, the workshop and in factories, or while doing the ironing. As popular music became rock and roll in the late fifties and early sixties pirate radio began to broadcast the sort of music young people wanted. Radio suddenly had a new life with young listeners tuning in to pirate radio stations such as Radio Caroline and Radio London.